Although Nelson Mandela (1918-2013) and Cecil Rhodes (1853-1902) were not contemporaries, they both played important roles in South African history. Mandela, of course, survived imprisonment for nearly 27 years for his struggle against the apartheid regime in that country to become its president and a world-renowned figure. Rhodes was an Englishman who earned a fortune from mining diamonds (De Beers Consolidated Mines) in that country and neighboring Zimbabwe (f/k/a Rhodesia) and who served as Prime Minister in the Cape Colony. In 1903 his will established the Rhodes Scholarships at Oxford University in England. 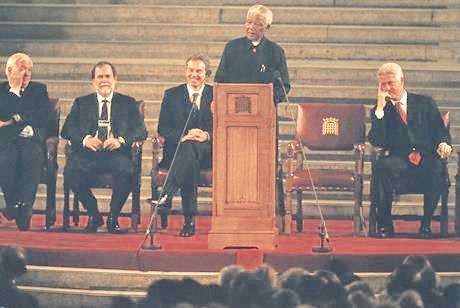 To mark this historic joint venture, Mandela addressed a gathering of Rhodes Scholars and dignitaries at Westminster Hall in London on July 2, 2003. Below is a photograph of his making that speech. 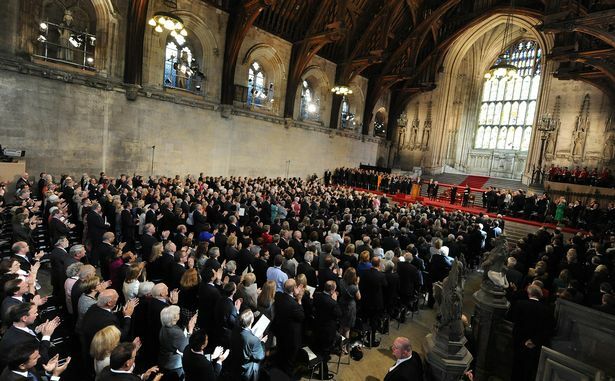 This blogger was present on this occasion in London’s Westminster Hall, and a prior post recounts the other remarks by Lord Waldegrave, the Chairman of the Rhodes Trustees; “Nicky” Oppenheimer, the Chairman of DeBeers, the diamond mining company started by Rhodes in South Africa; Bill Clinton, the former U.S. President; and Tony Blair, then the Prime Minister of the U.K. Most memorably when all the speeches were finished, everyone on the speakers’ stage walked the over 200-feet length of the hall through the audience. Mandela, then nearly 85 years old, and frail, was aided in making the long walk; his right arm was held by Tony Blair; his left, by Bill Clinton. They brought tears to our eyes as they passed six feet from us on their journey through the Hall. Below are photographs of the three men during their walk and of the Hall (with a different audience). Mandela, Address at sitting of joint houses of Parliament, Westminster in celebration of 100 years of Rhodes Scholars (July 2, 2003). Stengel, Mandela’s Way: Lessons for an Uncertain Age, Chaps. 6, 7 (Broadway Books, New York, 2010, 2018).